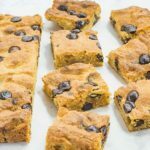 Keto Blondies Recipe - "Peanut Butter Choc Chip Brownies" - Easy To Make! These Low Carb Peanut Butter Blondies are one very delicious treat. They’re crumbly, fudgy and hard to stop eating after you’ve had one! Place the softened butter and peanut butter in a mixing bowl. Using a hand mixer, beat on medium speed until smooth. Add the Natvia and beat on medium speed until the mixture is pale and fluffy. Scrape down the sides of the bowl with a silicon spatula occasionally. Add the eggs and vanilla and beat until combined. Add the coconut flour and baking powder and beat on low speed for 5 minutes until the ingredients are well mixed. Clean off any mixture from the beaters. Add the chocolate chips and stir through with a spoon. Pour the mixture into a lined square cake tin. Place in the oven for 20 minutes, the Blondie is baked when an inserted skewer comes out clean. The Blondie will be very fluffy and will drop slightly when cooled. Allow to cool slightly before cutting into 16 pieces and enjoying.